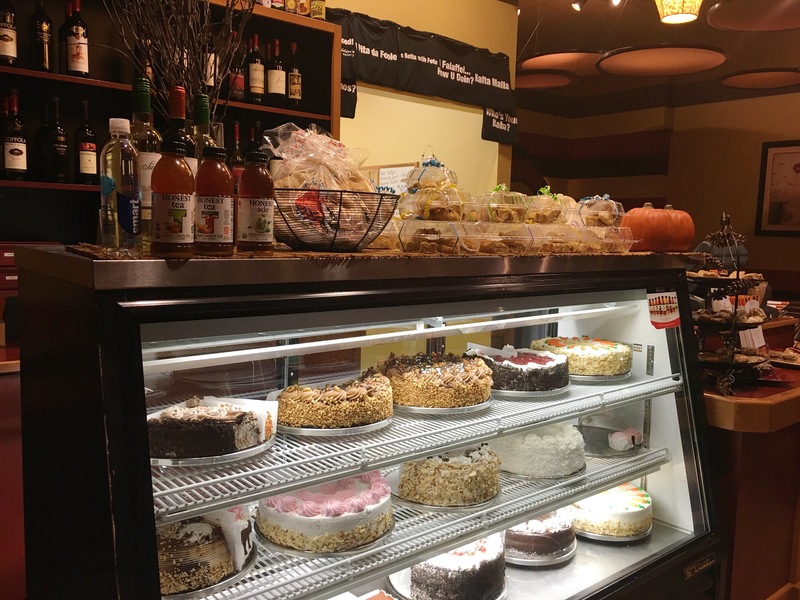 Aladdin’s Eatery – Go There. Try That. Some dear friends of mine recently moved to West Chester so we were looking for a restaurant for dinner. After a little research, we settled on Aladdin’s Eatery, a Lebanese restaurant in a warm, yet casual environment. None of us have much experience with Lebanese food so this was an adventure- just how we like it! 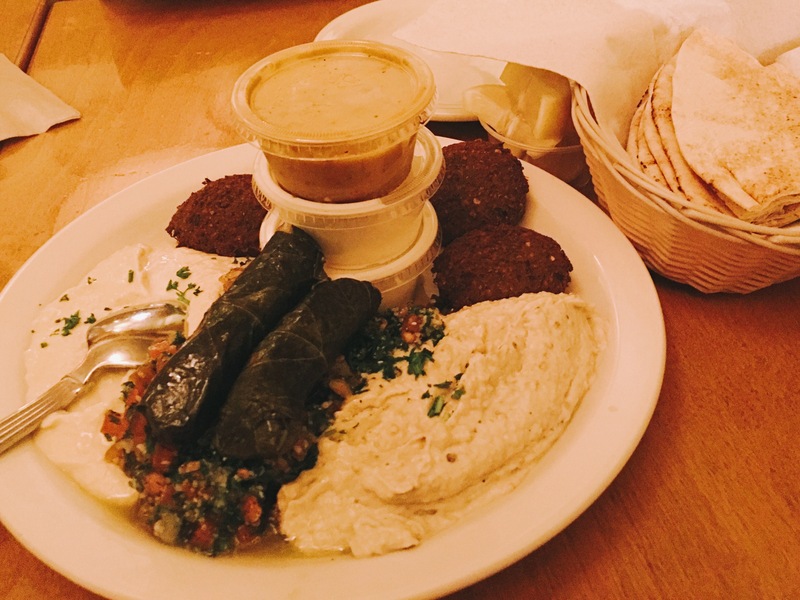 We started with the vegetarian combo app which came with a sampling of hummus, baba gannoj, tabouli, falafel, dawaii, and a basket of pita bread. Incredible flavor and texture. We experimented by adding some of the garlic sauce and hot sauce to each and it was delicious. By the end we were mixing the tabouli with both the humuus and baba gannoj and sweeping it up with the pita bread. 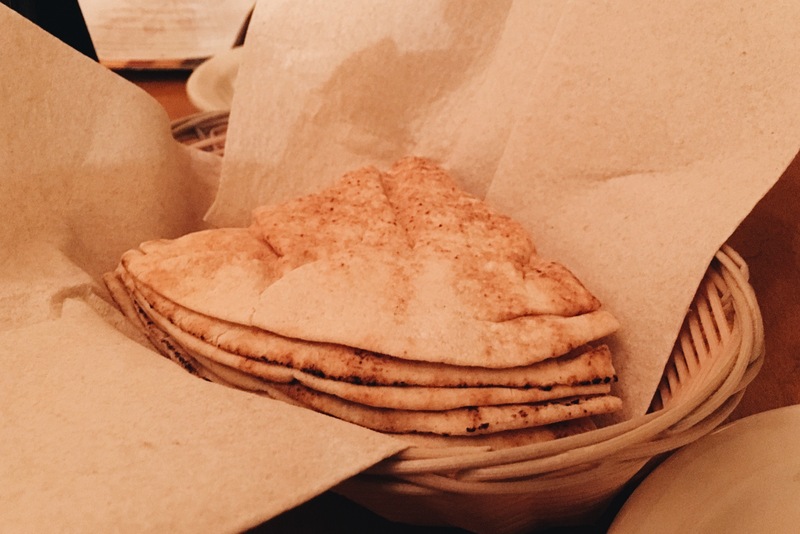 Needless to say, we requested another basket of pita bread! I’ve always been a fan of hummus, but I was so in love with this tablouli which had sweet onion, diced tomatoes, herbs, lemon, and fresh parsley! It was super fresh. According to our waitress, the hummus and baba gannoj take three days to make- in house! We devoured the falafel too (fried spiced vegan patties made with chickpeas, fava beans, parsley, and scallions served with Tahini Yogurt); the dawaii (rolled grapes leaves filled with rice, chickpeas, tomatoes, and parsley was our least favorite, but trust me, it still got eaten. This plate it a great way to start, especially if you like to share! The mood lighting made my images a little dark so the pics really do not do the food justice. 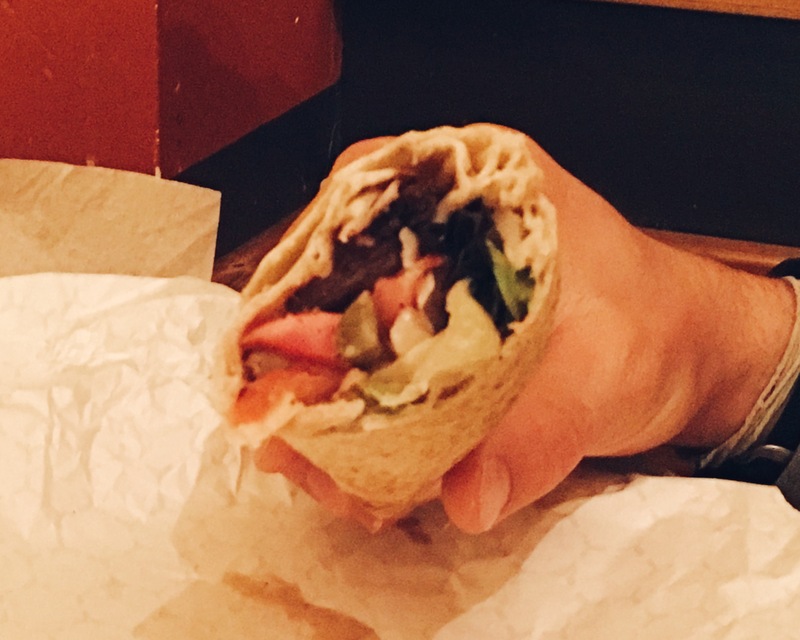 You can get extra pita upon request! 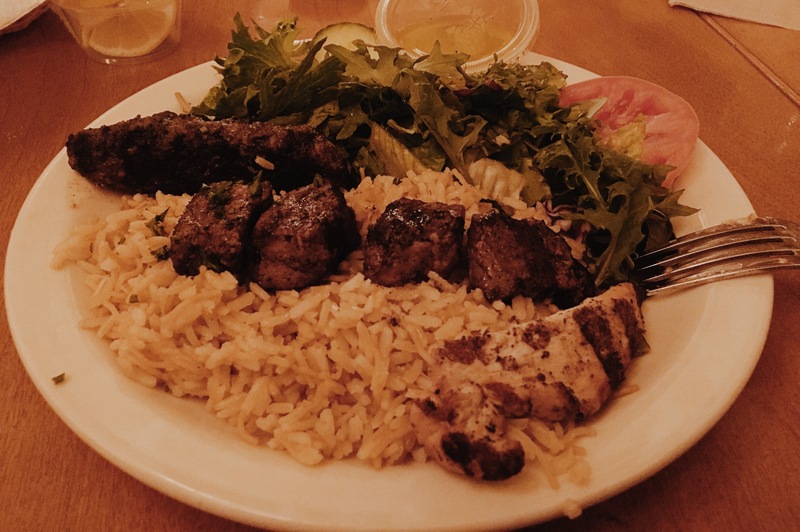 Aladdin’s Favorite Combo: Here you get a plate with beef kafta, shish kabob, and shish tawook (grilled chicken) on a bed of seasoned brown rice with vermicelli, served with greens, sliced tomatoes, and cucumbers. Basically, you get to try several types of meat- each seasoned and cooked to ideal tenderness. To me, the rice is a bit tame, so I would have liked more veggies or meat- which is definitely the star. 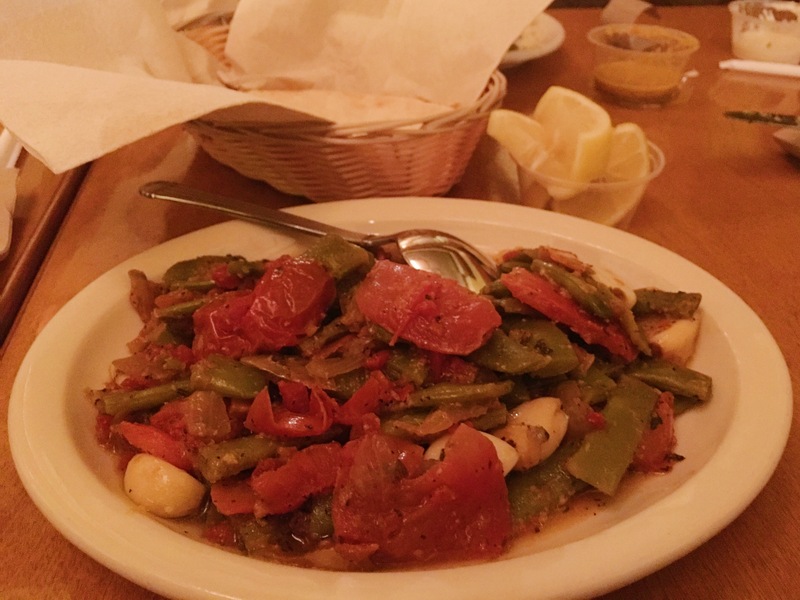 Loubie: This dish consists of Italian green beans sauteed with onions, tomato sauce, and whole cloves of garlic. This one sounds simple, and in a way it is; however, it’s nicely seasoned and a really great take on green beans, which is one of my favorite vegetables. You can get a smaller version of this as an appetizer or side dish. That would be my recommendation. 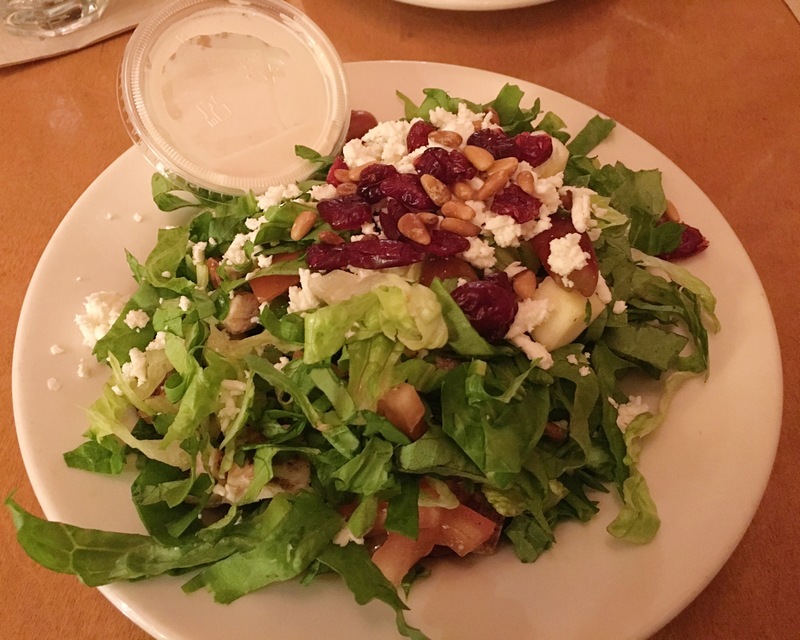 Taza Chicken Salad: My husband really enjoyed this salad of chopped spinach and romaine lettuce, squash, zucchini, grapes, dried cranberries, tomatoes, and chopped marinated chicken tossed with tahini dressing and topped with feta and roasted pine nuts. The lettuce was shredded so mixing everything together was easy and, according to him, the grapes and dried cranberries added a sweet-tart note to the other savory ingredients. I’m really weird about fruit in my salad, but I trust my husband’s judgement on this one. Aladdin’s Lamb Roll: OK, this is kind of like a sandwich of fire-grilled lamb seasoned with herbs and spices topped with tomatoes, onions, greens, turnips, pickles, and tahini yogurt dressing. Winner winner lamb dinner! I was stoked about my combo plate, but I wanted to steal this entire roll and order another one. The flavors were bright, the pickles added some texture, and the tahini matched perfectly with the lamb. Yummy! I also have to mention customer service. To me, this often matters just as much, if not more, than the meal. 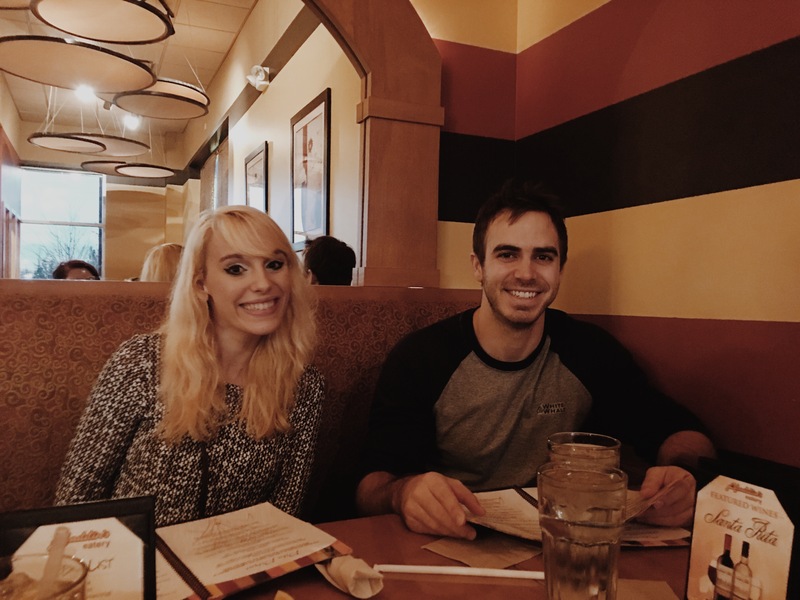 Our waitress, Biz, was phenomenal. 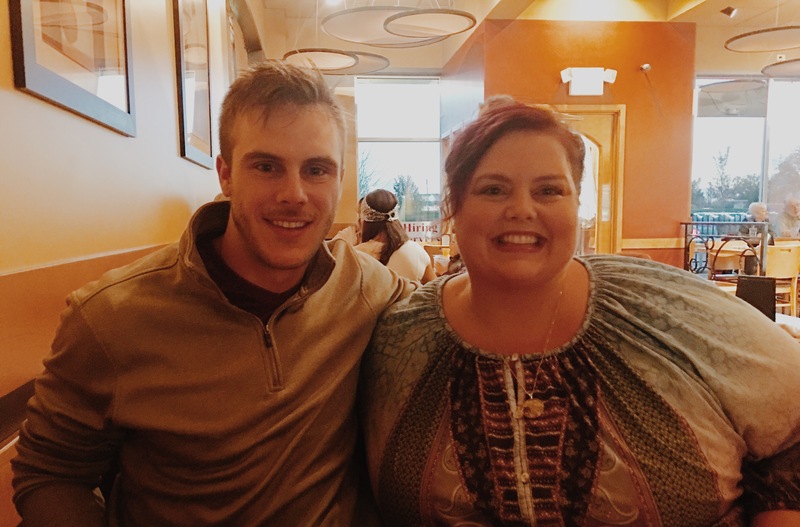 She took a friendly and clueless group of five and walked us through the entire menu (it really is extensive), offered great recommendations, quickly aligned her wit with our banter. To sum it all up, no to-go boxes were needed! Plus, the food at Aladdin’s seems very healthy, so you don’t feel bad for wiping your plate clean. The dessert case looked stunning, but we were all too full to try anything! Maybe next time! P.S.- they have a Hyde Park location as well now. 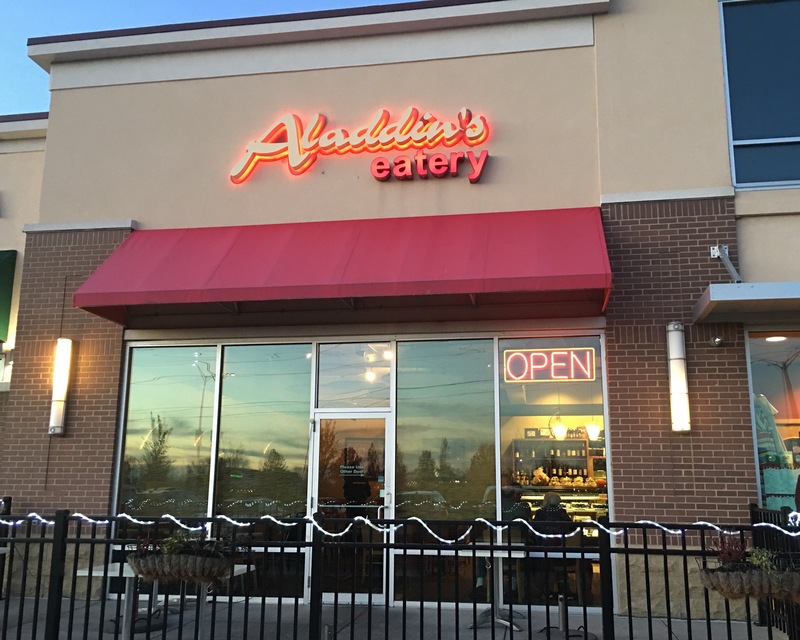 GO THERE (Aladdin’s Eatery)! TRY THAT (Vegetarian Combo Plate, Aladdin’s Lamb Roll)! Didn’t they just open up on in Hyde park? Let’s go sometime! Definitely. I’m craving that lamb roll. I’ve wanted to try this place!!!! I love this cuisine! One of my favorite places to eat! Next time, make sure to leave room for their awesome Tiramisu . . . .if all of it hasn’t already been eaten!! Thanks for the recommendation David- will do! !